This past week we packed up our house, moved everything into storage and moved in with my parents. We’re closing on the new house on Monday (if we can avoid the hurricane) and will hopefully be moved in before we head to Boston next Friday. Basically, I haven’t had much time to think about blogs, let alone what we are going to do while we’re in Boston (if anyone has any suggestions, please share!) but I managed to take some pictures of the quinoa tabouli salad I made recently so here’s the recipe! It’s delicious and will be stay just as delicious all week for lunch. 1. Make quinoa according to the package and set aside. 2. 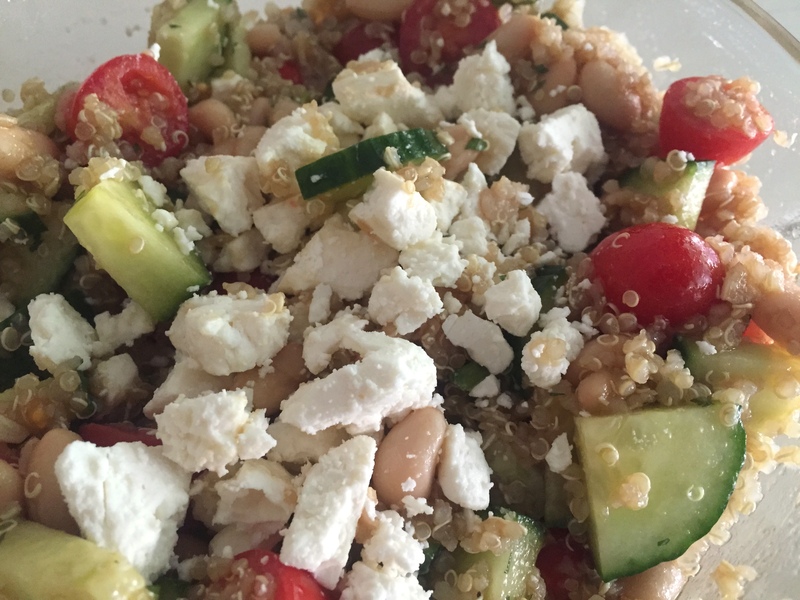 In a large bowl combine cucumber, tomatoes, beans, green onions, mint, parsley and quinoa. 3. Pour the dressing over the salad and stir. 4. Add feta cheese on top. 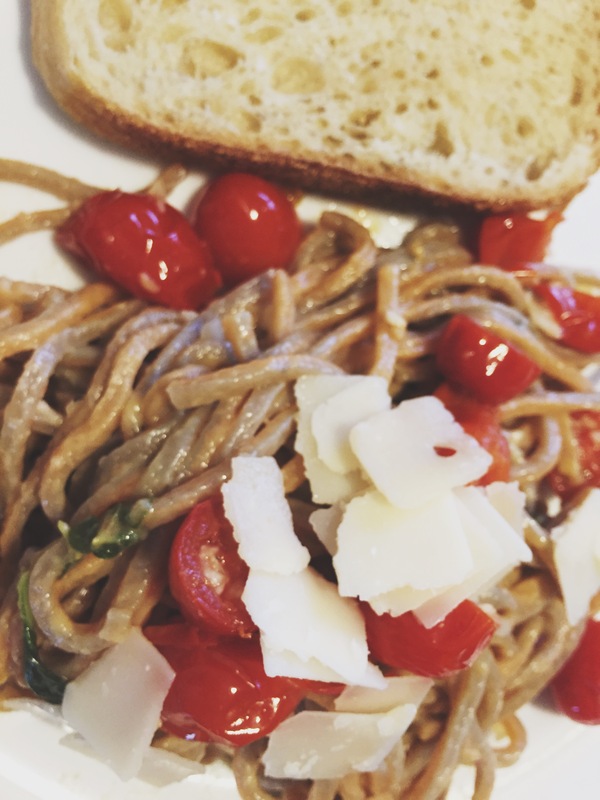 I followed [this recipe] but made adjustments based on what ingredients I had. You could easily switch it up with a different dressing or add in other veggies you have in the fridge! Since we’re trying to clear out the fridge before we move this weekend (eek!) I’ve been trying not to buy too much food to get us through the week. That’s where crockpot meals have come to the rescue! I can make one thing in the crockpot on Monday and it will last us through the week. 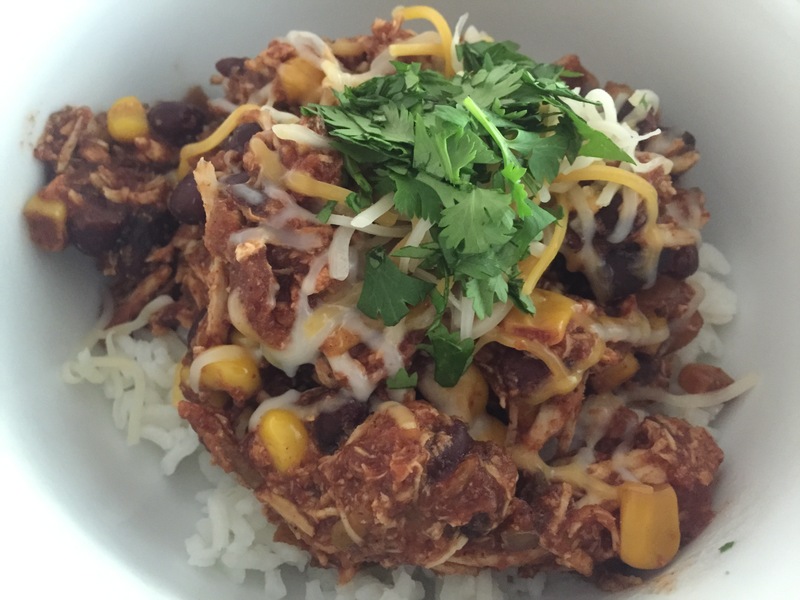 Last week’s recipe was taco chicken. You can eat it over rice, with chips, in a tortilla or by itself. It’s so good you will want to try it every way! Put everything except the rice and toppings in the crockpot, make sure the chicken is covered. Cook the rice before the chicken is done. When chicken is done, shred it with a fork and stir in crockpot. Create the bowl by first adding rice followed by the chicken mixture and top with any toppings (I had cheese and cilantro)Enjoy! 1. Cook the noodles al dente. 2. In a saucepan melt the butter and add garlic for one minute. 3. Add cream cheese, 2 cups of milk (save 1 cup for later) and the cheese. Stir until cheese begins to melt and set aside. 4. In a separate bowl, add 2 eggs and the last cup of milk and whisk together. 5. 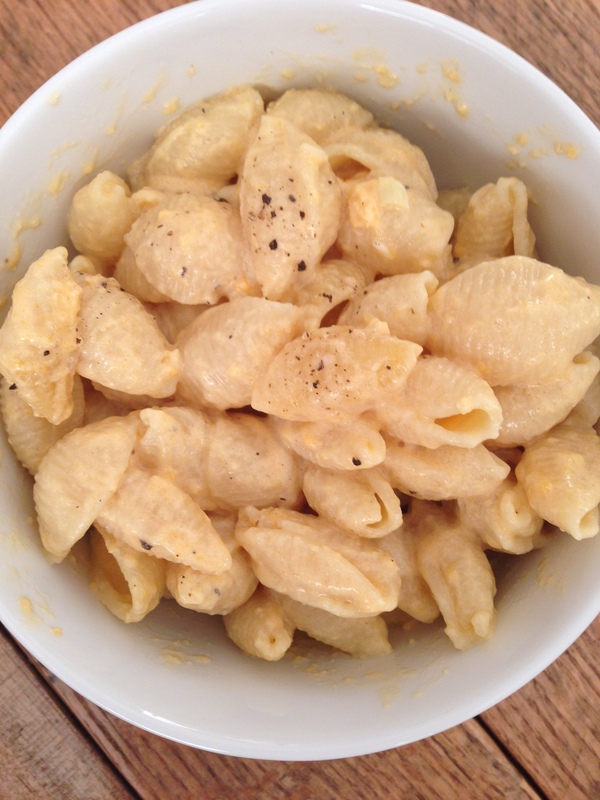 Add the drained noodles, cheese, and egg mix to a crockpot with salt and pepper and stir. 6. Cook on low for 1 hour. 1. Slice 2 green tomatoes into 1/3 inch slices. 3. 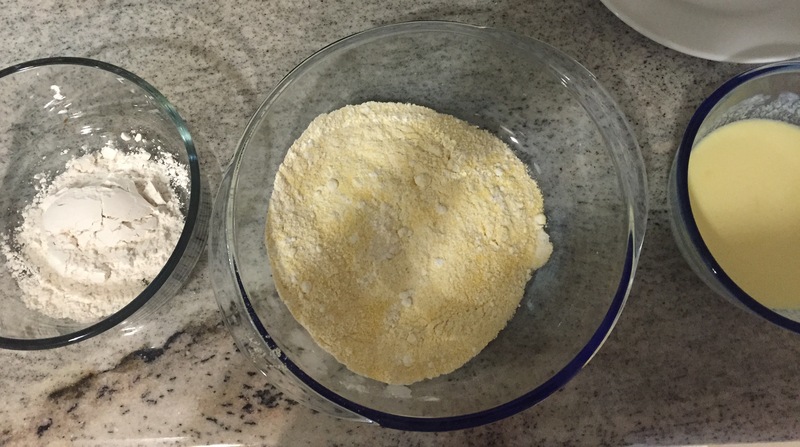 Dip each tomato slice in each bowl in order, first the flour, then the egg mixture and finally the cornmeal. 4. 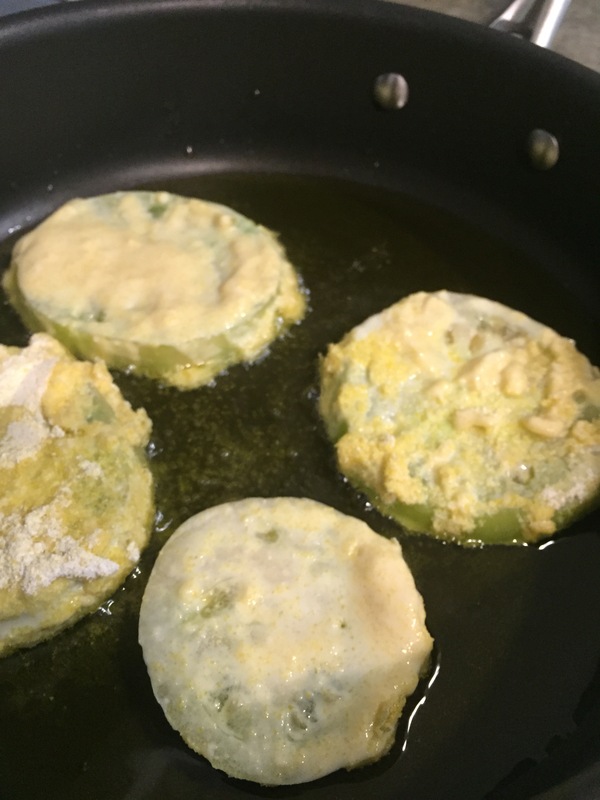 Pour oil in a skillet and heat at medium-high. 5. Drop each tomato in the oil and cook for 2 minutes on each side. Put on a plate lined with paper towels. 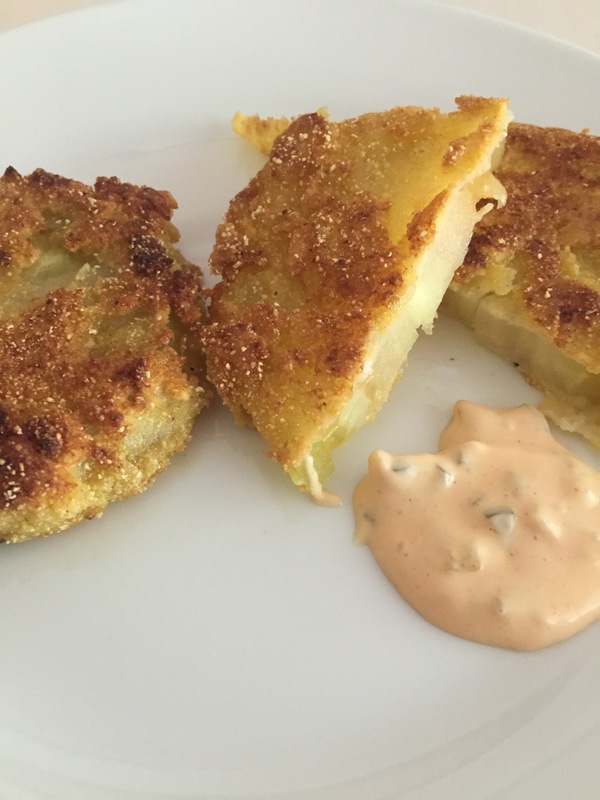 We whipped up a quick sauce made with mayo, hot sauce and relish :) Enjoy! 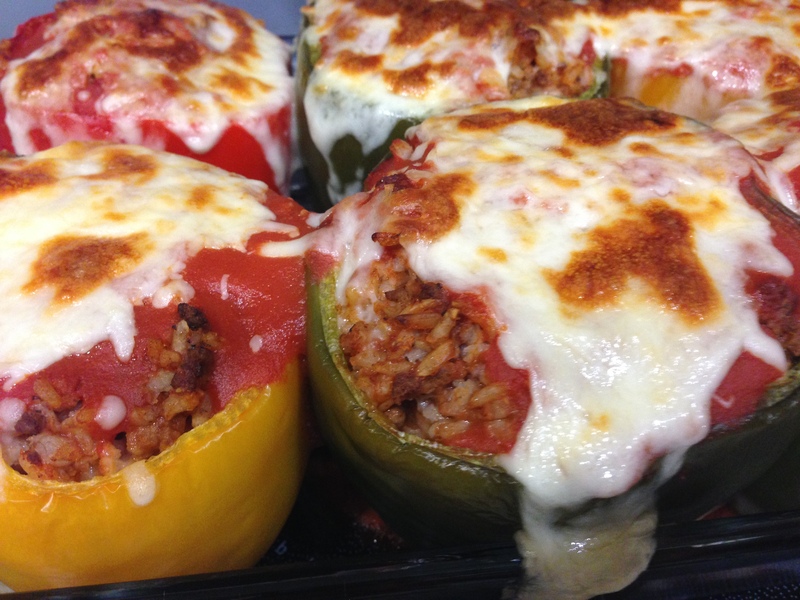 Stuffed peppers make for a hearty meal with great leftovers! My grandma used to make stuffed peppers all the time and although I don’t have her exact recipe, this one is definitely reminiscent of it. It’s always extra special when a meal is not only delicious but has memories that go along with it! 11. Add mozzarella cheese over the top and bake for another 15 minutes, until cheese begins to brown. Do you have any recipes connected to good memories?